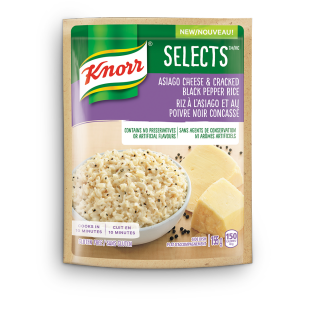 Knorr Selects Asiago Cheese & Cracked Black Pepper expertly blends rice with asiago cheese and cracked black pepper into a delicious rice dish. Long Grain Rice, Asiago Cheese (Dehyrdated), Salt, Corn Starch, Yeast Extract, Black Pepper, Olive Oil, Sodium Phosphate. Contains Milk. May Contain Soy, Sulphites. 1. Pour Selects into a medium saucepan. Add 1 ½ cups (375 mL) water, 1 cup (250 mL) milk, and 2 Tbsp. (30 mL) unsalted butter to the saucepan. 2. Give it a stir. Bring to a boil, then lower the heat to medium and boil UNCOVERED for 10 minutes, while stiring frequently, until rice is tender and sauce is creamy. 3. Turn off the heat and wait at least 5 minutes for the sauce to thicken. Stir once more and enjoy.